Hail, Caesar! is tremendous fun – a very silly love letter from the Coen brothers to the movies which came out of the studio system in the early 1950s. Although the majority of publicity has focused on George Clooney’s role as Baird Whitlock, a chiseled hero and star of the biblical epic film-within-the-film (also called Hail, Caesar! ), the story is actually a complex patchwork of interlinked homages orbiting the central figure of Eddie Mannix played by Josh Brolin. It is 1951 and Mannix is the chief fixer at Capitol Pictures – sorting out the problems on set and acts of moral turpitude by the stars of the pictures. It comes as a surprise to discover that there actually was a real Eddie Mannix whose job was very similar – he worked as a fixer for MGM. However this Mannix character, as played by Brolin is an amalgam of the real figure and his colleague and head of publicity at MGM Howard Strickland. The figure played by Brolin is fictional. Brolin’s character is a devout Catholic, a family man, and the film is bookended by confessions with his Priest. What happens between these scenes may seem like a loose collection of comic vignettes, and to a certain degree that’s true. But they are all part of a rich plot web, interconnected and carefully structured. All the problems and fixes he deals with are closely mapped out and finally coalesce into a plot which is far more complex than it appears on the surface, while at every turn displaying the Coen’s love of movies and movie history. One of the main joys of setting a film on a studio lot is that we get to see the films in production. 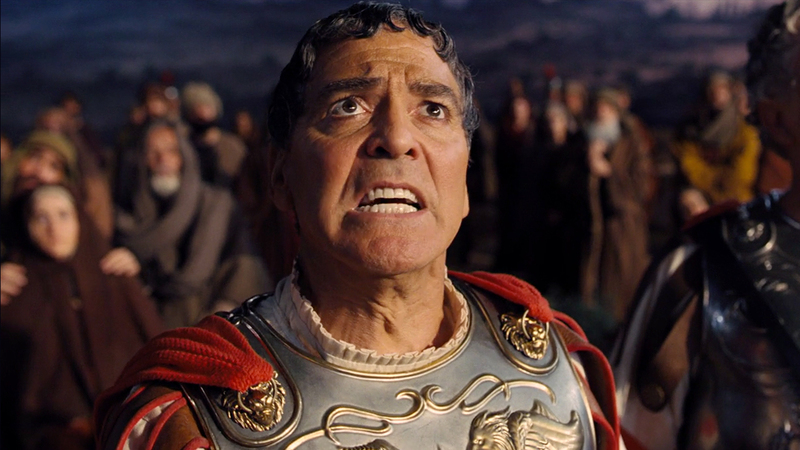 The biblical epic Hail, Caesar! A Tale of the Christ is the structurally important movie as Clooney’s Baird Whitlock is kidnapped before the filming of the final scene. This is the event which kick-starts the plot and starts things unravelling. Elsewhere on the lot, Scarlett Johansson plays a swimming musical star in the vein of Esther Williams complete with accompanying musical number, while Channing Tatum playing Burt Gurney takes part in a tap routine as one of the retinue of musical sailors which seemed to predominate the movies back then. In many ways this is the closest we’re likely to get to a Coen brothers musical. We even see a singing cowboy strumming his guitar and belting out a song. In fact the stand-out comedy scene of the whole film takes place as we watch Hobie Doyle, the sweet singing cowboy of limited acting skills played by Alden Ehrenreich, drafted into a high class drama and being directed by the exasperated but beautifully patient director Laurence Laurentz played by Ralph Fiennes. It is simply one of the funniest things put on a cinema screen in a long time. All of these things are important building blocks in the story of the film, and all elements are connected together with a genuine playfulness. If this film doesn’t win the full 5 stars it’s because there is a vague sense of aimlessness to the proceedings which shouldn’t really exist, as the plot is a lot tighter than it might appear. If the plot doesn’t seem quite as tight as it really it is, then that’s down to the pacing which is given slightly too much space to breathe. The film could be as tight as the plot it is hung around. It’s never boring, never dull, but there is a quiet sense that things could be happening slightly more snappily. It remains a delightfully heightened reality. It’s a comedy, and the character’s journeys are, for the most part, to service the humour. Eddie Mannix’s confessions bookend the movie for a reason – his decision making is the emotional centre of the story. But it is funny, silly, daft, and once again beautifully shot. Cinematographer Roger Deakins, working with the Coens for the 12th time, has a huge amount of fun re-staging the cinema of the 1950s. Lighting the epic (but studio bound) scenery of George Clooney’s Baird Whitlock reacting to the death of Jesus (see above) results in some of the best shot stuff in ages. The performances across the board are wonderful, there is not a weak link in this starry cast. Clooney, Brolin et al are all excellent. The brief appearances of Frances McDormand, Tilda Swinton and Robert Picardo are also all very entertaining. However if anyone should be given special mention it is the brilliant Ralph Fiennes, who once again proves he has the lightest of expert touches when it comes to comedy performance. And the Coens of course. They know what they’re doing. Hail, Caesar! is on general release now, and is tremendous fun. Recommended.